DI Crabbe retires from the police force after being shot and sets up his own restaurant. However, his ex-boss, Chief Constable Fisher constantly calls Crabbe back on duty. The series follows the adventures of married couple Nicola and Charlie Buchanan, who run an industrial cleaning business while solving the most baffling murder mysteries. Agatha Christie's husband-and-wife sleuthing team take on a series of short whodunit mysteries. 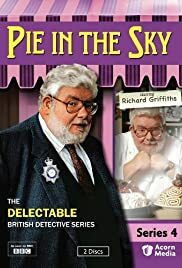 "Pie in the Sky" is a guilty pleasure of mine: not great television, but I admit a show I watched religiously. It follows the police and restaurant life of one Henry Crabbe (Richard Griffiths). He is a Detective Inspector who gets shot in the line of duty, following which he wants to retire to open a restaurant - the titular "Pie in the Sky" - as cooking, especially of good English styled cuisine, is his passion in life. However standing in his way of this dream is his boss, Assistant Chief Constable Freddy Fisher (Malcolm Sinclair), who refuses to issue a full retirement pension because the incident in which Henry was shot has raised some questions about Henry's police conduct. In reality, Freddy knows that Henry is innocent of any impropriety, but uses this only as a reason to keep Henry, Freddy's "brains", on the force: Henry does all the brain work, Freddy gets all the glory. However, Freddy does allow Henry to work on a part-time or "on call/as need be basis" (i.e. whenever Freddy is in a jam, which is always) while the shooting incident is investigated. This leaves the possibility of a full pension in the future if Henry is cleared, but in the meantime also allows Henry to open his dream restaurant with all this extra time he has on his hands. The second conflict in the series is between Henry and his accountant wife Margaret (Maggie Steed). Margaret supports Henry in his dream - in actuality, the restaurant is under her name - however in her mind the restaurant needs to be solely operated in a cost efficient/effective manner regardless of the result on food quality. This stance is enhanced by the fact that Margaret is a non-foodie who does not appreciate good cooking: she would much rather eat a bag of crisps than to sample Henry's creations. The remaining cast of characters are an assortment of police constables/sergeants working with Henry (played by Bella Enahoro, Darren Litten and Mary Woodvine) and restaurant staff (wait staff played by Ashley Russell, Alison McKenna, Samantha Janus and Marsha Thomason; kitchen staff played by Joe Duttine and Nicholas Lamont; produce supplier/farmer played by Nick Raggett). The one other story twist is that both of his assistant chefs are reformed ex-cons on the "mend"  they are basically good people who had been caught in bad circumstances prior to Henry's salvation of their lives. Their love of cooking and food outweighs their police records. The strength of the show is that the main cast of characters are likable, even that of Freddy Fisher. As such, you root for the characters in whatever situation they may face. Even when there are conflicts between main characters, such as the episode where John the waiter (Ashley Russell) and Steve the chef (Joe Duttine) are constantly at each others' throats, you like them both because they are basically good people but just different personalities. All the story lines are the classic "good" versus "bad", and very rarely do characters fit into that grey area in the middle. Even when guest characters fit into that grey area, they are always portrayed in the end as either on the side of good or bad. The other strength of the show is the food. Much like food themed movies like "Babette's Feast" or "Eat Drink Man Woman", there is an obvious love of food by the series creators. Yes, one really would like to sample Henry, Steve and Gary's (Nicholas Lamont) culinary creations, perhaps with the exception of the episode with the Stargazy Pie. And based on the series' concept, "good English cuisine" is not an oxymoron. Beyond some holes in the basic series' concept, the weakness of the show is that the characters are a little too extreme in their portrayal, especially that of Henry and Freddy. Henry is just a little too smart (he is right 99% of the time) and Freddy a little too callous. With the former, Cambridge (Bella Enahoro), Guthrie (Darren Litten) and Morton (Mary Woodvine) all come off as capable enough police officers, but dim wits compared to the ever knowing Henry. No fault of the any of the actors but rather of the writers. Overall, an entertaining but somewhat mindless and inoffensive series. A pure guilty pleasure.